Cravens Manor is a 16th century manor house located in rural Suffolk. You'll find Cravens Manor in Henham, which is a small village just down the road from Southwold. 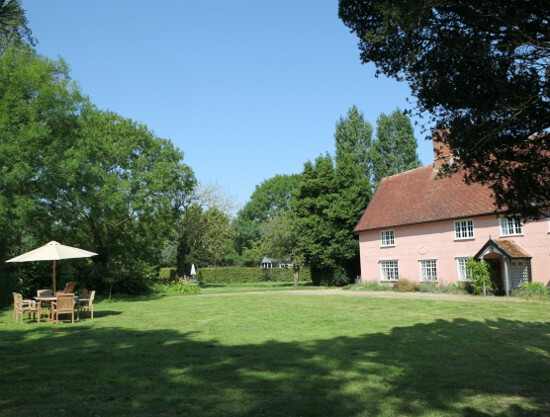 Cravens Manor sleeps 12 people, and makes a lovely location to take a holiday in Suffolk's countryside; and with a tennis court & swimming pool - you can't go wrong! Cravens Manor sleeps 12 people in 6 bedrooms - 3 double bedrooms and 3 twin bedrooms. There is also three bathrooms at Cravens Manor. Cravens Manor has a living room with an open fire, and a separate sitting room. You also have a TV room at Cravens Manor. You have a TV, DVD player, CD player, Wi-Fi, range cooker, microwave, fridge/freezer, washing machine, tumble dryer and a dish washer. Along with that open fire, Cravens Manor also has oil central heating. With your bed linen and towels included. Cravens Manor is set in 2 acres of grounds, which include a tennis court, swimming pool and a patio area with furniture and a barbeque. The outdoor pool is available in the summer months, with the photo below showing you want to expect. There is plenty of parking at Cravens Manor, and holidays start on a Saturday. This part of Suffolk has lots to offer you for days out. Southwold is a close by, and is famous for being the home of Adnams Brewery - Southwold is certainly the place to come to sample some of Adnams' delights! It's not all about the brewery, Southwold also has a lovely beach to spend your summer days on; or to take a bracing winter walk. Further south along the coast is Aldeburgh, which is also a lovely seaside town to visit. You can head inland from Cravens Manor and visit the market towns of Halesworth and Beccles. Or hire a boat on the Norfolk Broads. The fine city of Norwich also has a host of restaurants, shops and museums. For those with children in tow, a few attractions you may want to visit include BeWILDerwood near Stalham in the heart of the Norfolk Broads; Pleasurewood Hills Theme Park in Lowestoft; The Southwold Maize Maze. Don't miss the pier at Southwold either - with its unique amusement arcade! Whether you fancy spending a quiet holiday at Cravens Manor, and make the most of the pool and tennis courts. Or you want to get out and see the Suffolk countryside, Cravens Manor makes a lovely holiday destination. Should Cravens Manor not be to your liking, but you fancy staying in the area around Southwold, you might well be interested in the cottages below. All these cottages are within a few miles of Cravens Manor.